Addressing the ceremony, Deputy Prime Minister Nguyen Thien Nhan said the project will not only promote the region’s socio-economic development and preserve the nation’s cultural value but also promote Vietnam’s image to the world. He asked related ministries, agencies, and Khang Thong Group’s partners to help the project begin operation in 2014 as scheduled. 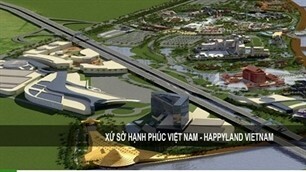 The US$ 2 billion Happyland Vietnam project covers a total area of 338 ha with Happyland Park, hotels, shopping centres, exhibition centres, restaurants, and indoor and outdoor theatres. Once put into operation, the project is expected to create 10,000 new jobs for local people and attract 14 million visitors every year.